Conversion of forested land to cultivation, for setting up ranches, for urbanization and for mines, dams and developmental projects- all comprise 'deforestation'. According to UN statistics, subsistence farming contributes to 48% of deforestation, commercial agriculture upto 32%, logging for 14% and fuel wood for 5%. 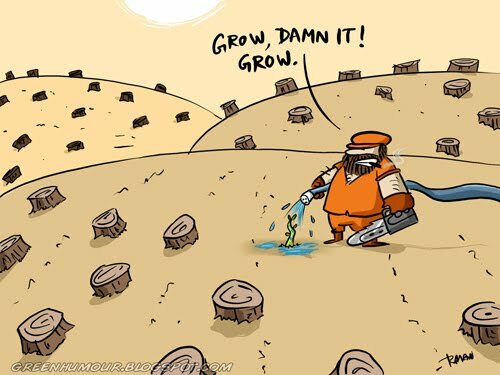 Deforestation increases the greenhouse effect and is a massive contributor to the acceleration of global warming. Here's one from the archives, re-drawn.